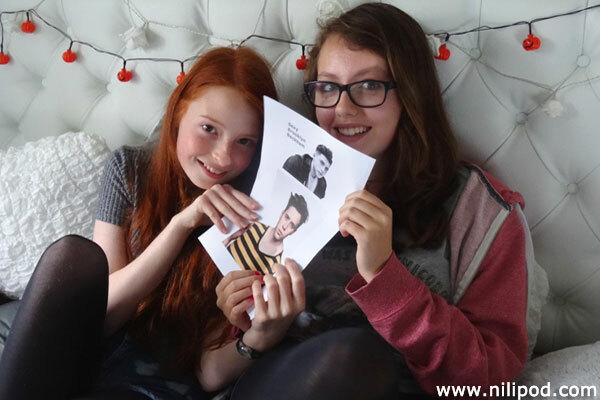 This photo shows us having a bit of a laugh as we pretend to fight over some pictures of Brooklyn Beckham in the bedroom podcasting studio, including a black and white picture, and one where he is wearing a stripy yellow and black bee-like vest top. We have always liked Brooks, but think that it is so funny how he keeps appearing in national newspapers for doing virtually nothing, like just walking down the road with his skateboard, or going to a concert with friends. We therefore thought that it would be good to make a feature about Brooklyn Beckham on our podcast, and the rest is history. The jingle is one of our absolute favourites and it was really easy to make, using GarageBand and our most tuneful voices - tweaked a little. Let us know what you think of the young Becks and his model looks. Maybe he listens to the podcast, who knows?! Stranger things have happened.